The weather the first couple of days this November has been good; wish we could say the same for river fishing. It has been poor for this time of the year; just good enough, as someone said, to keep em interested. The excuse; no shiner run. Monday afternoon I fished the river for about three hours. There were only three other boat out on such a nice afternoon. All I had heard was to fish shallow, so I anchored up in thirteen feet. Sometime between 3:00 & 4:00 there was a short bite and I caught three nice 16″ walleyes and two small sauger. The next two hours I only had one good bite and caught a nice 24″ walleye. Tuesday, Don and I fished the same area from about 4:00 until 6:30. 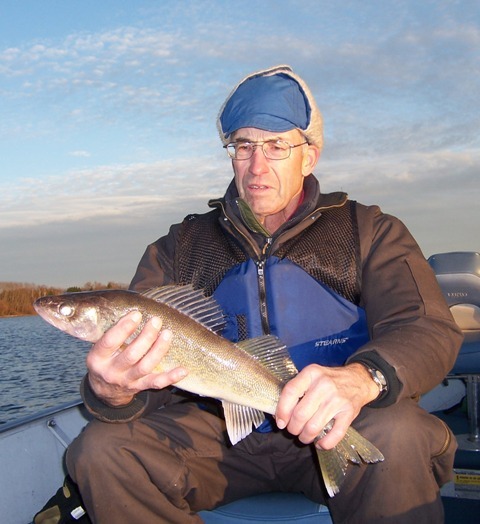 For our efforts we caught five walleyes; one 16″ to keep; one little one and three in the slot from 21″ to 23″.